The first time I saw the Echino Lion fabric, I thought it was totally weird - yet intriguing. I couldn't figure out what I'd do with it though, it's not really something I wanted to put into a quilt. But it was one of those fabrics that I never stopped thinking about. 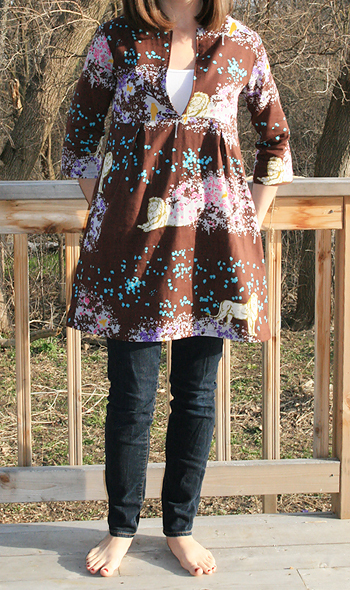 Then when I was looking online, I saw the fabric used as a class sample at The Needle Shop for the Schoolhouse Tunic by Sew Liberated. It was the perfect combination of cool and crazy. :) I had to make it immediately. Luckily I found enough of the fabric left at Harts Fabric, although now even the brown is sold out there. The tunic was very simple to make. It was actually my first time making something with sleeves I think. That made me a bit nervous, but really it was very simple. It was also my first time working with double gauze fabric. The only thing I found tricky was if I made a mistake and needed to remove stitches. That was more difficult than with quilting cotton, for sure. Overall I love it! It's at a length that is *just* too short for me to feel comfortable wearing it without pants, but I think if I made it about 3" longer it'd be an adorable dress. (Add it to my list!) Still trying to figure out what sort of shorts/capris to pair it with for summer. But for today I'm sticking to my skinny jeans - which I swore I'd never buy....never say never! And another photo just for fun, we have a couple deer that live in the woods behind the house. Last night at dinner time they both came into the yard and let me walk near them for a photo. We tease Avery that they are going to go for a ride on her swing.